There is something soothing about knowing you can take something as delicate and delicious as a peach and turn it into something even more delicious. These jars of peach butter will sit patiently on the shelf just waiting to get used. 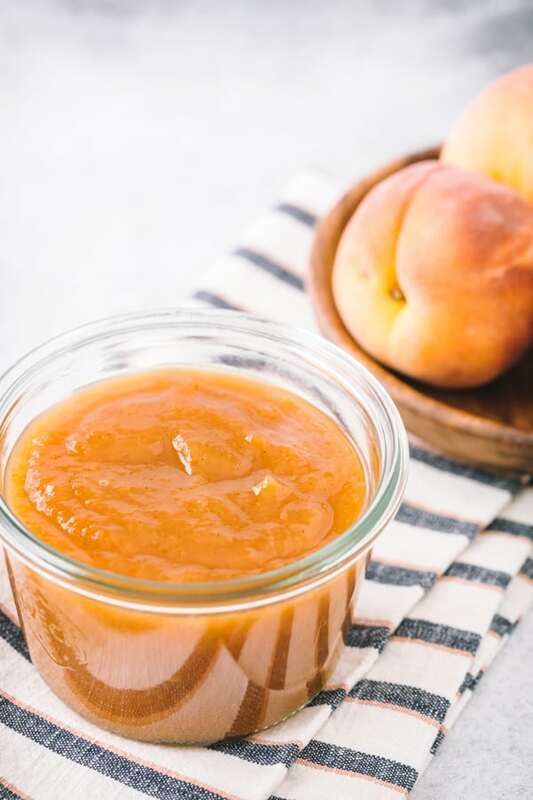 In the middle of winter, when I’m cursing myself for living in New York, I can go into the pantry, open a jar of this vanilla honey peach butter and taste the flavors of summer. It’s what I love most about canning. You can easily bottle up the flavors of the season and have them anytime you want. I picked all these peaches myself at a local farm – Fishkill Farms. They are a sweet mix of yellow and white. The day I went and picked there were so many peaches on the trees that the branches were sagging just trying to hold them all. It took me less than five minutes to pick over twelve pounds of peaches. It was a very successful day. Since I now had a kitchen full of peaches I needed to do something with them. Of course, eating them was an option but there are only so many peaches one girl can eat. I knew I had to can them in some way. I was a bit jellied out so I opted to instead make a fruit butter. I found a recipe I liked and decided to alter it just a bit to bring some vanilla flavor to the mix. Vanilla and peaches are one of my favorite flavor combinations. The butter was extremely easy to make and only took 5 minutes to process for canning. You can of course keep your fruit butter in the fridge (I would say use it in a month) if you do not want to fully process but you might want to cut the recipe in half. It makes six full 8 ounce jelly jars. Source: Adapted from Better Homes and Gardens Canning Magazine. In and 8 - 10 quart heavy pot (I used my Le Creuset ) combine peaches and the water. Bring to a boil and reduce heat. Simmer cover, for 10 - 15 minutes or until peaches are tender. Remove from heat and cool slightly. 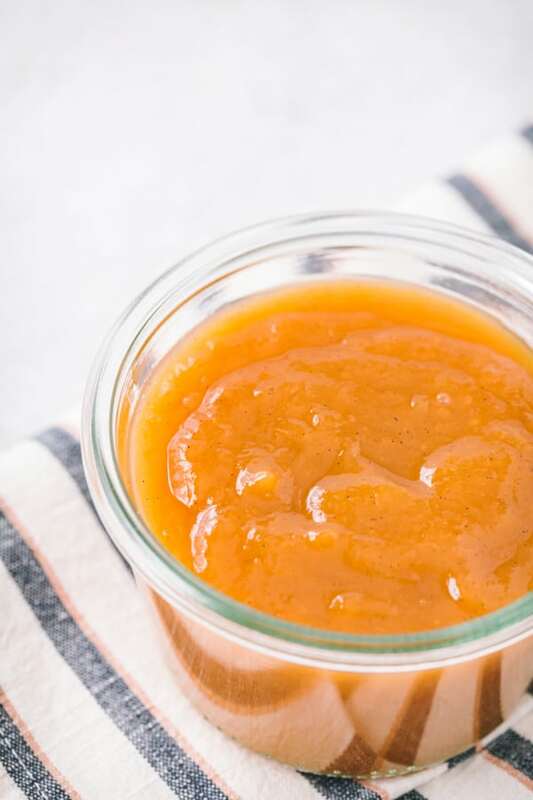 Use a blender or food processor to puree peach mixture, in batches, until smooth. Return peach puree to same pot. Add sugar, honey and vanilla bean seeds and empty vanilla pod. Bring to boiling, stirring until sugar dissolve - reduce heat. Simmer, uncovered, for about 10 minutes or until mixture is thick and mounds on a spoon, stirring often. Take out vanilla pods and ladle hot peach butter into hot, sterilized half pint canning jars , leaving a 1/4 inch headspace. Wipe jar rims, adjust lids. Oh I would be licking every oz off of my fingers! Yum! Wow, these look gorgeous and I bet they tasted even better!!! I am a little nervous to can but this looks so good I may have to get over my fear! I love your handwriting! It’s so nice I suspected it might be a printed label so I compared the writing and found that the labels weren’t exactly the same, so I knew they were hand-written. So pretty! Not to mention what’s inside the jar, lol! This sounds so wondermous, no wonder you wanted to submit it to the fair. Do you know with canned goods at our fair, they are only judged by appearance? If people are submitted stuff like this, that is such a travesty that it doesn’t get tasted! Peach jam is one of my favorites but I’ve never made a peach butter. This recipe sounds amazing! I just made peach jam for the first time last week! I haven’t eaten it yet, but I ended up with eleven 1/2 pint jars. 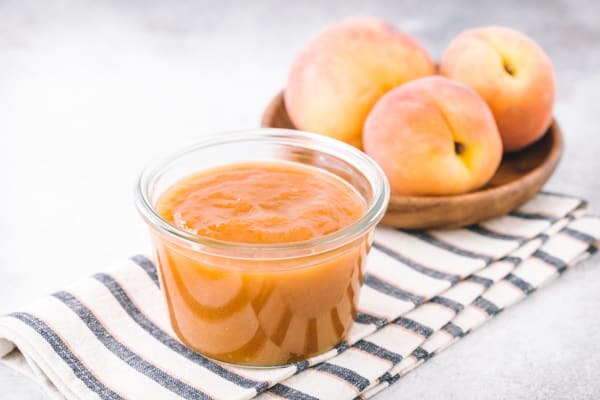 I’m going to try peach butter this weekend because although I love jam, it has a stiffer texture and I think I’ll like the smooth, softer texture of a peach butter. That’s a gorgeous peach butter! I haven’t done any jams/jellies/butters yet this year. Think I better get started! Oh my, this sounds amazing!!! I am planning to go peach picking this weekend, and I think I need to make this with some of them. Yum! oh I love butters, peach and pear are my favorite. I still have a big bottle of pear butter in my pantry. The addition of honey and vanilla is brilliant 🙂 I need to do this with my nectarines. Enjoy your peach butter. looks amazing! it sounds great and I bet it tastes even better! Obviously I need to go peach picking now. Not sure I’m going to be able to survive the winter without at least thirty jars of this stuff! In response to your comment, I’m not sure if I’m going to the wine and food festival yet! I’m applying for press passes so we’ll see…otherwise I’ll have to hope that someone wants to sponsor me to go! Bookmarked it (thumbs up) on Stumble upon so I can make it sometime. Love this idea!! I agree…your handwriting is beautiful. Getting ready to make your crust….from way back when (I blogged about it on my mango rhubarb tart). It’s a nut based crust I got from you…SO good!! That looks heavenly! I am definitely going to try this recipe! yes! This is exactly what I was looking for! Some way to save that peach flavor for the winter. I’m totally making some this week! What an awesome combination…it sounds like heaven on toast! that sounds like such an amazing treat in the winter! i am from connecticut and this would bring such warmth on a snowy day!! i might make this tomorrow! Im so lame. I’ve never canned anything. It scares me. Like sourdough scares me. It’s irrational. This looks SOOO good, I really need to just buck up and do it! I love peach butter! Great pictures. They made me wish like crazy for a chance to can some more jam and butter this year. This looks incredible. If I could can anything this summer, this would be it!! What a wonderful hostess gift idea! All I can say is yum, yum, yum!!! This recipe is so easy and sounds so amazing. Can’t wait to try it. Such a great spread, I would love it in my oatmeal. That peach butter looks divine. Now I’m really wishing I had picked up some more peaches at the farmer’s market this afternoon. “vanilla honey peach butter” would make a great body splash too 🙂 I can almost smell it. Eat it, wear it! Just made this. Amazing. Simply amazing. Used 20 peaches, substituted the 2 and a quarter cup of white sugar with one cup white sugar, half a cup of brown sugar and half a cup of agave nectar. Ended up with 14 half pint jars and 2 quarter pint jars (total of 15 cups of butter). They were big peaches I guess. The sweetness level is perfect. Thanks a lot for an amazing recipe! I’m glad you tried the recipe! I love that you added brown sugar and agave…I will have to try that next time! Love your website, by the way! You are inspiring! Omg I would be eating so many spoonfuls during the process… I want to go back to the farmer’s market and get the end of summer peaches. This sounds so delicious I can’t wait to try it! Beautiful and delicious sounding recipe!! I made a batch yesterday. The only problem I had was that when I followed the recipe exactly, my peach mixture was the consistency of soup still, not thick enough for peach butter. To remedy this, I just transferred the whole mixture to my crockpot and cooked it on low for 5-6 hours and then left it on warm overnight. It should end up being thick so that when you lift it with a spoon and dribble it back in, the ribbon of butter stays on top of your mixture before blending back in. If you do it this way, you can also add a bunch more peaches since the crockpot will cook it down so much. I added more peaches and still ended up with just 4 half-pints, the perfect amount for our little family! This sound divine!!! I made this yesterday and i am going to test it today. I did it two different ways not knowing exactly whether to include the peeled or not include the peels. Could you Tell me whether or not to include them? Otherwise, the recipe is looking fantastic!!! Thx for putting it on the web!!! I peeled the peaches, then realized I didn’t have vanilla beans or even vanilla extract, but I DID have almond extract. So I tried that…with crazy fantastic results. Super delish! My family is devouring the stuff. Later this week I am very excited to try the recipe as is and I am sure the results will be equally great. Thanks for a good recipe! Hello, my mom and I made this today and it looks delish….the only problem was that it doesn’t seem to be as thick as it sounds like above. When we were slicing the pieces of peaches there was liquid from them that we ended up mixing with our 1/4 of water. should we have drained this? What is the consistency that yours comes too? Ours was a little thinner than applesauce? Need help to understand for future makings…thank you!! Am making this right now. Just finishing up the water bath as I type this. It smells soooo very good. I wasn’t able to count out the peaches as I had already cut the peaches I figured would be good for jams etc. into very small pieces and froze the rest in sliced form (I had picked about 30 lbs of Elbertas). So, I measured out 8 rounded cups of my cut pieces and that seems to be working well for me. I have some “accidental” leftovers for my ice cream tonight 😉 I was also too lazy to run to e store for vanilla beans, so used vanilla extract instead. I know the beans would taste better, but made do with what I had. I also added in some cinnamon and ground ginger. Oops. I meant “6” rounded cups, not “8.” Also, this is extremely delicious on my ice cream. I may have to make crepes or pancakes next weekend just for the peach butter. Thanks for the recipe! Hi – I just made a small batch of this, to use up some peaches before they went bad. (Was intending to make a pie, but I just didn’t feel like dealing with pie crust today!) It is Absolutely Delicious! Thank you so much for sharing – I’m glad I found your post! I’m so glad you enjoy the peach butter! Thank you so much for letting me know! Thank you for this recipe. Everyone I have given it to has LOVED it, and I’m giving everyone your website. Pretty sure this peach butter is the best thing about Summer! What grade of honey did you use? Hello Jamie! I’m apologize I missed this comment! I just checked my honey and it says that is is Grade A. Hope that helps! Can you use just honey instead of honey and sugar? If so, how much honey would the recipe call for? 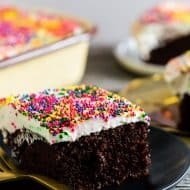 We are trying to eliminate refined sugar from our diet and this recipe looks so yummy that I’m hoping it can be made with more honey and no sugar. Thanks! Hi Marjorie! Thank you for coming back and letting me know you loved the recipe! I LOVE the idea of adding pumpkin pie spice! Do you think this would work in a crockpot? I have made regular (plain and boring!) peach butter in the Crockpot…wondering if this recipe would work! Hi Cheyenne! I think it would work but I cannot confirm this since I have not done it before. BUT I don’t see a reason why it wouldn’t work 🙂 You would still want to process it in the hot water canning bath if you plan on canning it though. i don’t do much canning so this could be a silly question. Do you need to use any pectrin or sure-gel? Hi Kim! Not a silly question at all! In a lot of jam/jelly recipes it’s common to use pectin but not in this recipe. It thickens up nicely on it’s own. Plus, since it’s a fruit butter it’s more a thick slathering consistency than jelly consistency. We just made this over the weekend and it is wonderful. My question is how should this be stored? Of course we opened a jar and refrigerated it after opening but how do we store the other jars? This looks delicious. I’m so excited to make this this weekend. I’ve got oodles of peaches just crying out for me. Question – have you ever made the butter one day and canned it the next day? I have a young toddler so sometimes I have to do these kinds of projects in smaller batches. I was thinking I could get the peaches peeled and the butter made in one nap time but I don’t know about getting the canning done too. I thought I’d make the butter one day and then fill and process the jars the next. Would that work? Hi Kasey! I replied via private email but just incase you didn’t get (and if others have the same question) I’m going to post the same response here. I actually do that all the time! As long as you get the peach butter hot (up to a low boil temp) before you fill the jars, it should be fine. The steps I wouldn’t split up is the peeling and cooking – if the peaches are peeled too early, they will brown. Hope this helps and hope you enjoy the peach butter! I just came across your recipe. It sounds delicious! Can’t wait to try it. Can you tell me the shelf life of the peach butter once it is canned. Thank you. Just a note. Tried this in the crockpot yesterday. Ended up finishing on the stove after 12 hours. I had very juicy peaches. Maybe if you vented the crockpot? I don’t cook or can, haha!! But I made this!!!! I’m so excited that I made it and I can’t wait to try it!! We just made this with peaches from a local orchard. It turned out beautifully! We made 2 double batches and plan to use this for neighbor gifts for Christmas. Thank you so much for the recipe!! I had a peach tree and peeled, sliced and froze a lot of peaches. Was wondering if this can be made with thawed – frozen peaches? Hi Mel! I have only used fresh peaches but I don’t see why using frozen peaches wouldn’t work. You might not need to add as much water since frozen peaches tend to be more watery but I think it should work fine. If it’s a little thing simply cook it down until you reach the desired fruit butter consistency. 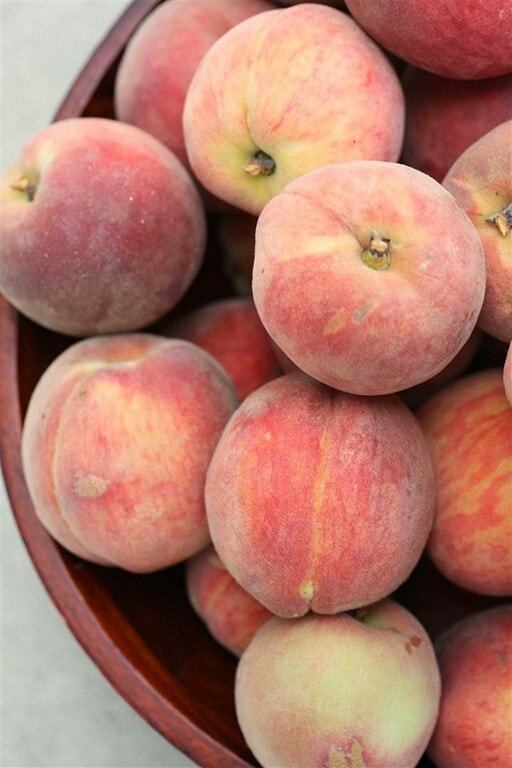 I’m going peach picking this weekend, can’t wait to try this recipe. How long will the processed jars last once stored? Should I keep in the fridge after processing or can I store in the pantry? Hi Pattie! No worries about the questions 🙂 In theory canning products should last years as long the seal never breaks. If you ever can and find something on the shelf that the seal has broken make sure to throw it away. When you “cook” the peaches it’s just so slightly soften them. You remove them from the water and let them cool. You do not use the water after that. You’ll just puree the peaches by themselves which at this point should be super soft and juicy. I hope this helps and good luck making the peach butter! Loved the taste of this recipe!!! I used 18 peaches, but they were big and I ended up with about 12-14 jars of various sizes (I was scrambling at the end to find more jars). 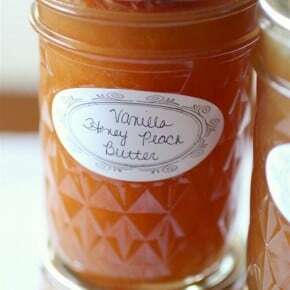 Everyone has loved this peach butter! The only thing I would mention about the recipe is the cooking time. I had to increase the cooking time significantly from 10 minutes to 30+ minutes and still I didn’t really have, “mounding on the spoon” consistently. A neighbor I shared the recipe with had the same issue as well. My consistency was thicker, but not butter like, but it still was a pleasant, “over ice cream or shortcake like” with which I was satisfied. I still spread it on toast and it’s an ok thin consistency, but I think next time I will have to cook down the batch more which means even beyond 30 minutes. Any thoughts or ideas? Thanks for sharing this recipe! Hi Debra! 1 or 2 teaspoons should be enough for the batch. I would add 1 and then give it a taste and see if it needs more. Hope you enjoy the peach butter! 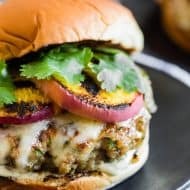 Hi, this recipe looked great so I kind of followed it ;-). I did a taste test with vanilla extract ( I have a good vanilla but no beans :-() Anyway, I didn’t like the taste test on that but I love cardamom so I tried a measly 1/4 teaspoon & YUM!! I used 17 medium peaches & 2/3 c raw yummy honey, 1/3 cup org cane sugar & 1/4 cup coconut palm sugar, juice & zest of 1 large lemon & it didn’t seem to thicken so added 2 pealed & puréed apples, 1 org & 1 ambrosia as that’s what I had. I boiled/simmered it for over an hour. Maybe even 1&1/2 hours. Then decided it was time to stop, so I may have peach sauce instead of jam or butter but it tastes awesome. I ended up with 9 – 1/2 pint jam jars. I’m sulfite sensitive & that’s in cane & beet sugar. Even organic cane sugar doesn’t work well for me but my water kefir likes it & eats it up so its gone when I drink that. Coconut palm sugar works ok for me but the taste is too strong for a lot of things with a more delicate flavor because it’s more like brown sugar. And I love raw honey but that just doesn’t work like sugar in recipes so it’s a hit & miss especially since I can’t eat eggs & am also gluten intolerant. Thanks for sharing your recipe!!! I am sure it’ll be great on my GF bread or buckwheat pancakes whatever the consistency. While the butter tastes amazing- it never set. It’s just a thick syrupy consistency Can you give me some advice? I am at about 5,000 ft + above sea level. Hi Rachel – I apologize for the delay in responding but you can always just cook the fruit butter longer to thicken it up. I know that at times it can take longer based on the natural juiciness of the peaches. Egads! Waaaaayyyyy too much sugar. It ruined the peaches for me. Hi Cheryl Ann – sorry it was too sweet for you! It seems to be a good ration for the peaches I get here in New York but I know that it can depend on the size and natural sweetness of the peaches you use for canning. 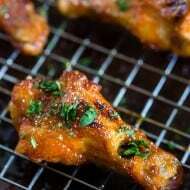 Just wanted to share I love this recipe. Thank You for sharing. Today I made some Peach BBQ sauce after two batches were done, I found myself with left over peaches. I had come across this recipe a few days ago so decided to try. I am so glad I did.